TOYOTA, Japan (June 23) Japan finished their June test series in style Saturday as they beat Georgia 28-0 at Toyota Stadium, one of the 12 venues for Rugby World Cup 2019. Having split their two-test series with Italy, the Brave Blossoms produced a mature performance despite conditions that seemed to favour the visitors. Heavy rain ensured a very slippery surface and both teams put boot to ball in the hope of winning the territory stakes and forcing their opponents into mistakes. It was a tactic that worked to Japan’s advantage though as not only did the Brave Blossoms field the Georgian kicks well, but they used a good chase game to constantly put the Lelos under pressure. The first half saw Japan take a 9-0 lead thanks to two penalties by Yu Tamura and one by Ryuji Noguchi as the Georgians were unable to cope with the pressure put on them in the loose. 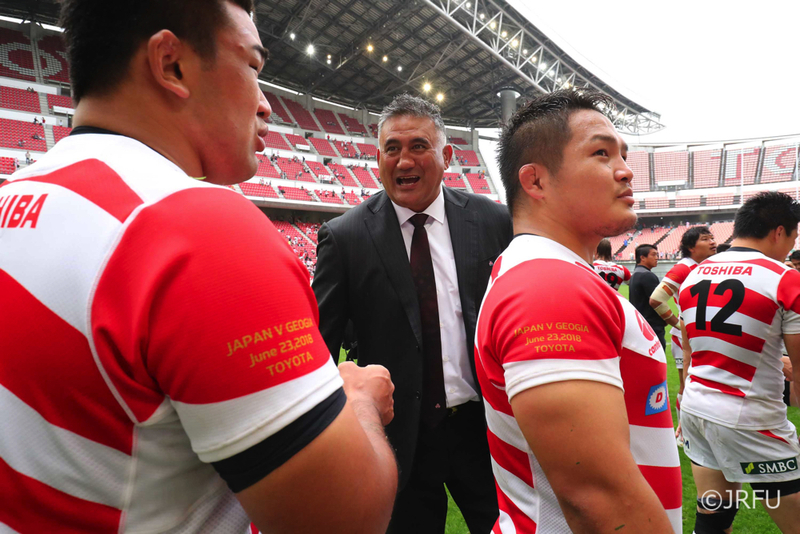 The second-half saw Japan lift the pace of the game and defy the conditions as they mixed their passing game with the kicking approach to good effect. Wimpie van der Walt scored Japan’s first try off a powerful scrum, Lomano Lava Lemeki added the second from a turnover in midfield while Kazuki Himeno crossed for the third following a good kick by Tamura and chase by Akihito Yamada. The Georgians threatened to score late in the game, but the Japan defense held firm to ensure the visitors remained scoreless.